Did you miss Saturday's Season 5 premiere of Star Wars: The Clone Wars? You have a couple options for catching up, besides any On Demand-style service you have that carries Cartoon Network programming. First up, StarWars.com now has "Revival" (S5 Ep. 1) online for repeated viewings along with a commentary video. This commentary video is quite different from years past and is billed more as a webisode called the Clone Wars Download. 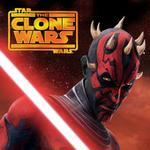 Episode 501 features David Collins discussing Darth Maul and the season premiere with Dave Filoni and Sam Witwer. If you prefer to watch The Clone Wars on your iPod, iPhone or iPad, Season 5 can now be purchased as a whole ($49.99) or per episode ($2.99) on iTunes. Curious as to what other folks thought of the premiere? Our team is back in the TCW swing of things with a TFN Review and the ForceCast Clone Wars Roundtable for "Revival" which was recorded live at Star Wars Celebration VI.